Are You Sharing Content on Facebook the Wrong Way? 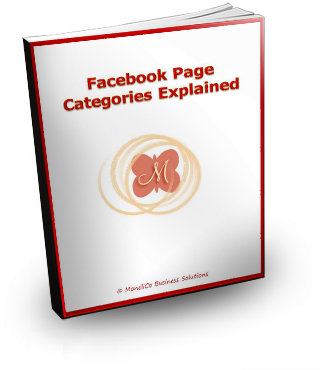 There are few things regarding they way sharing on Facebook works that I want to make sure you are aware of. Have you ever seen this message? This is usually seen in Group posts and the reason is that when you “share“ (using the Share button/link on Facebook) from a Closed or Secret Group or from a status that is not set to public, most people will not be able to see the attachment, unless they are part of the original group you shared it from or friends with the person who originally posted the status update. If it is a link or photo you want to “share”, it is best to copy the link/text or download the photo first, then create a new post. Be sure you have consent from the person who originally posted the content. If they did not share it publicly in the first place, there could be a reason. 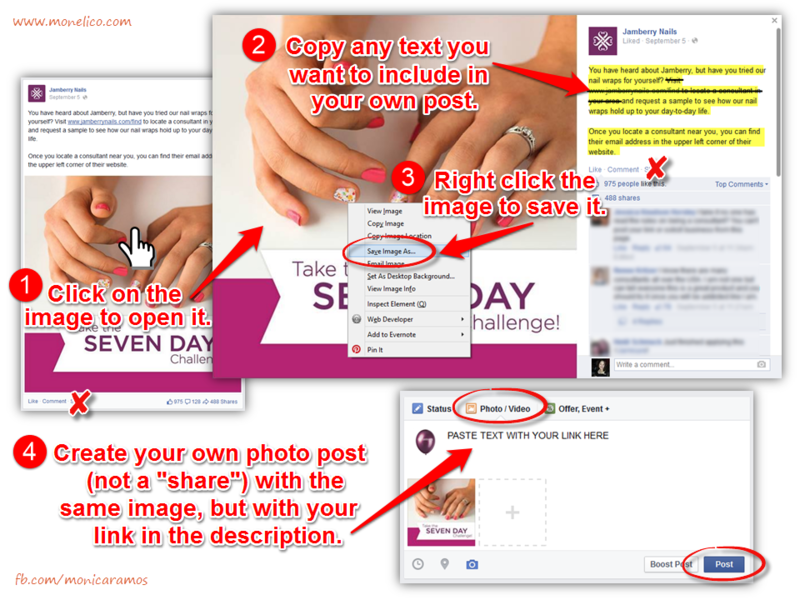 Another important mistake I see people making when they share content on Facebook, especially in Direct Sales, is sharing using the share button/link instead of recreating the post themselves. 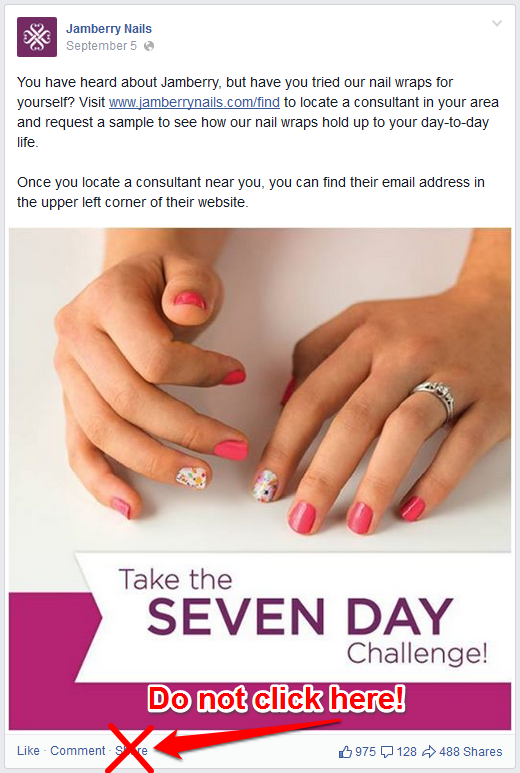 When you see something on your Corporate Page or another Consultant’s Page (perhaps your upline) that you would like to share, and have permission to share, make sure you are downloading the content first, then uploading it as a new post from your Page or Profile with YOUR website and contact info in the description. If you just hit Share, you are sharing it with THEIR info. 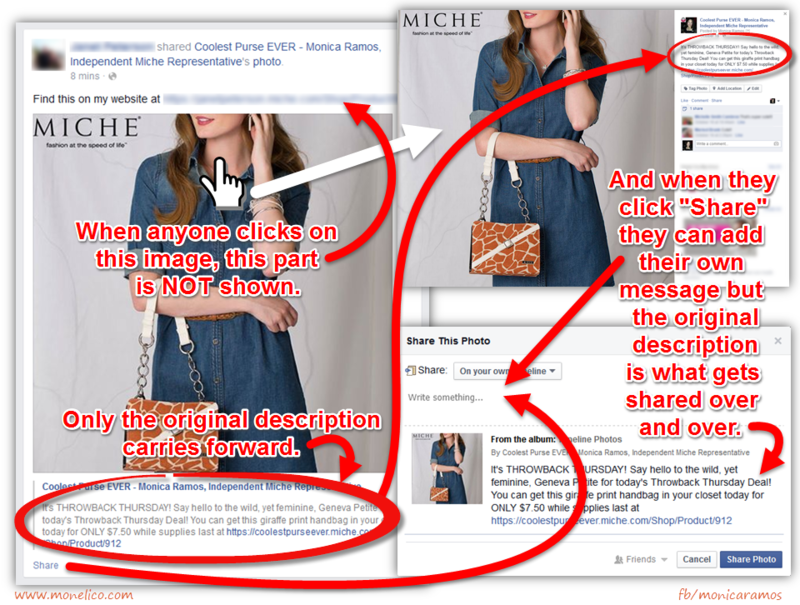 Instead, save the image and copy the description, then post it directly to your Page as a status update. Be sure to change the generic link, or a link back to the company’s main site, to YOUR personal website before posting. 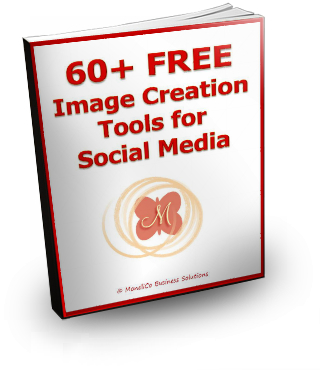 Start by clicking (or tapping if using a mobile device) on the image you want to share. This will enlarge the image. If you want to use the same text for your post, copy any text you want to use from the description of this post. Don’t forget to replace the corporate link with your personal link when you paste it into your own post. Right-click (or tap) the image to save it to your computer or mobile device. 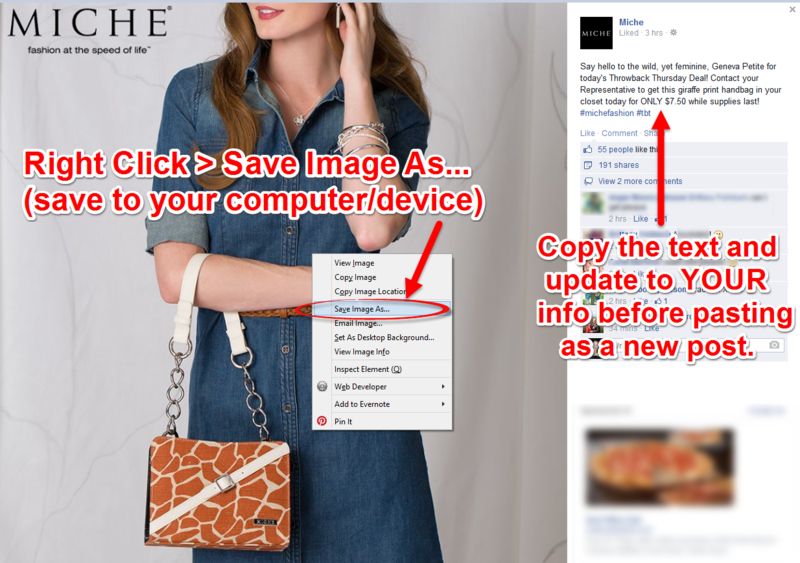 On your Business Page (logged in as your Page) upload the image and paste the text with a link back to your site. Now each time this post is “shared” from your Page, it will include your contact information and your links. Doing it the other way it would have carried the original links and text with it each time it was shared. 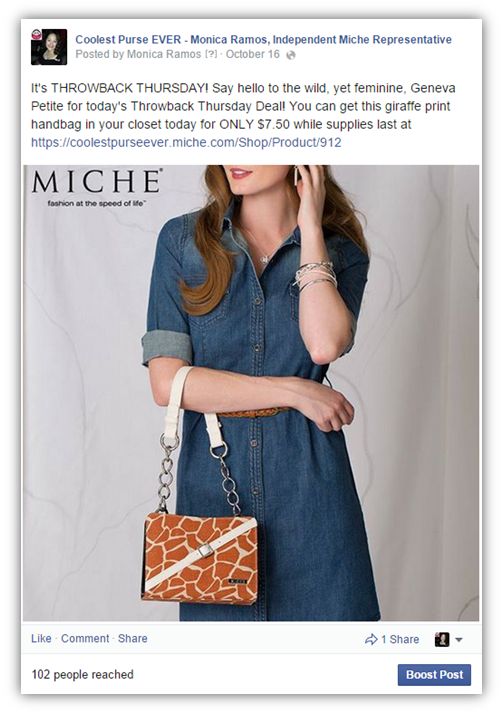 I saw this post on Miche’s Corporate Facebook Page and instead of clicking Share, I downloaded the image and copied the text they used. That is the way I recommend you share (the better way). However, just a few minutes later, one of my Fans who is another Miche Representative (someone I do not know) shared the photo I posted above. When I clicked on the link to get more details, I could see that she shared my post (using the Share link) and added a message with her link. Unfortunately for her, adding a message to a shared image does not remove or replace the original text in the description, and even worse, it does not continue with the image after it is shared. Bad for her, but good for me in this case. When you share a photo from someone else’s Page and add your own message with a link to your own website, it does not change the description originally created by the person or page who uploaded the image. The original post/image is carried forward every time it is shared. That means that if any of your Fans (if you share as your Page) or Friends (if you share as yourself on your personal Timeline) share this post/image, it’s the original description (not yours) that gets shared. Clicking on Share gives the user sharing the content the opportunity to write their own message (this is what the person who shared my post did), but that does not continue with each share. This is a HUGE mistake I see too often, so please inform your team members and fellow consultants! Below is a video you can share with others (or share this blog post) to let them know. If you found this helpful and would like more tips like this, check out my e-book: The Top 25 Facebook Tips for Direct Sellers, and be sure to subscribe to my monthly newsletter and become a fan on Facebook to stay informed. 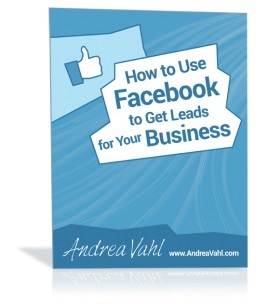 There’s a discount code for my e-book offered in the video above. 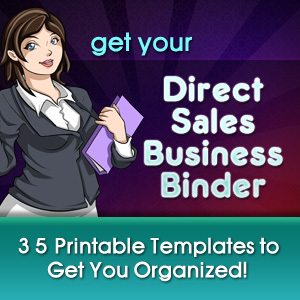 Monica Ramos is a certified Social Media Manager specializing in Facebook for Small Business Owners (Home Business, Direct Sales, Network Marketing). 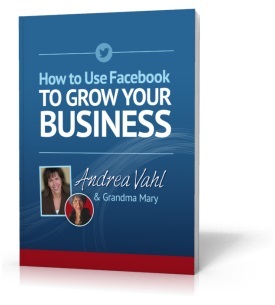 She offers free tips on her Facebook Page and conducts free educational webinars 2 to 3 times per year. To hire Monica for personal business coaching or as a trainer/speaker for your next event, visit her web site by clicking on the link above. Like Gating is Gone! And I Couldn’t Be Happier! Why Do Apps Need Access to My Profile?